American Artists 1259. Evangel Temple Christian Choir. Reach Out and Touch. LP. 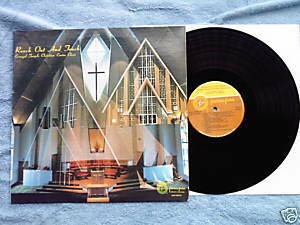 Tracks include Halleljah, Love Was When, Peace, Hallelujah Yes Praise, Would Your, title track. Choir directed by Sharon Wilkins. Sopranos include Debbie Amstutz, Mary Biro, Janie Bonds, Sherry Brent, Becky Huechteman; altos include Sonja Baldwin, Linda Gott, Shirley I Jones, Betty Leembuggen, Maryann Mansu; tenors include Dave Amstutz, ROn Brent, Clifford Creek; basses include Randall Baldwin, Winky Farrand, Glen E Guiney, Duane Huechteman. Choir accompanied by Carol Wilson. Pastor David C Rees-Thomas. Vinyl is VG; cover with graphic and photos is VG with very minor ring wear on front.